Our aim in the Phenom II budget system is to provide a configuration that allows for a nice balance of performance at stock speeds. This doesn't mean you have to spend a lot of money though, as Phenom II prices start at $120 now that the competitive dust has settled. In addition, other component prices have dropped in the past six months and performance for the dollar has definitely increased. The budget build is around $750 complete with a 1080p LCD Monitor, speakers, Vista Home Premium OS (OEM), and a mouse and keyboard. The basic box is just over $400 with a case and Gold Editors' Choice 550W PSU. If you are pinching pennies, you can go with a name brand case/power supply combo and get the basic Phenom II box below $400. The assembled system is balanced for a wide variety of computing tasks, but final tweaks can tilt it toward gaming and graphics for example, if that is what you aim for. 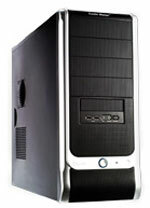 Generally we consider PC gaming rigs to begin at the next price category (i.e. the low end of midrange), but adding a decent graphics card will definitely make the Phenom II budget system, built around the AMD Phenom II X3 710, a good choice for entry gaming at around $850. Just add the $100 Radeon 4850 from the value systems on the next page. The Phenom II x3 710 is the least expensive Phenom II you can buy, but it is still a tri-core design clocked at 2.6GHz with the same L1/L2/L3 cache as the more expensive Phenom II designs. The 710 provides plenty of power at stock speeds, but if you want more the 45nm Phenom II processors overclock very well. If you want a bit more performance, overclocking the 710 should be fine, but if you want to seriously explore overclocking you can spend $20 more for the 720BE that has an unlocked multiplier. We've paired the Phenom II 710 with the ASRock 790GXH/128M AM2+, a perfect match for those looking to squeeze as much performance out of their money as possible. The ASRock is loaded with overclocking features and includes integrated AMD HD 3300 graphics with an HDMI/DVI interface and 1080p support. This means very decent performance using the onboard graphics. This ASRock board offers both AM2+ and AM3 CPU support for processors like the Phenom II 710 when used with cheaper DDR2 memory. ASRock includes 128MB DDR2 sideport memory for improved GPU performance, VIA VT1708S 7.1 Audio codec, Gigabit LAN, 16GB memory support, six 3Gb/s SATA ports capable of RAID 0/1/10/5, a PATA port, 10 USB ports, two PCI-E x16 slots (dual x8 CF), one PCI-E x1 slots, and two PCI slots. The BIOS caters to the casual overclocker and this board performs very well in a variety of tests. We've chosen OCZ Reaper 4GB DDR2 1066 (PC2 8500) in a 4GB kit for just $36 after a $25 rebate. This is a great value in DDR2-1066 memory from a top memory supplier. The extra 1066 speed combined with the fast 5-5-5 timings lets you run your memory at a faster speed or provide reserves for overclocking the CPU. OCZ is a great memory choice, but there are many memory options at great prices today. Quality DDR2-800 and DDR2-1066 RAM from Corsair, OCZ, G.Skill, Mushkin, Patriot, and GeIL are available at any of the major online retailers. Just be sure to look for RAM with better timings if you can afford it. The hard drive is a 500GB Seagate Barracuda at just $59. If you'd prefer a larger drive you can substitute a 1TB Seagate for just $85 - only $25 more for twice the capacity. The DVD burner is a dependable Samsung 22X often chosen for budget builds. If you want alternatives, as always you can look to the other builds for larger drives and Blu-ray support. The case/PS is the Cooler Master Elite 330 and our AnandTech Gold Editors' Choice BFG Tech LS Series LS-550 550W power supply. The BFG currently has a $20 rebate that reduces the final cost to $60. 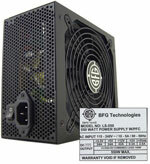 The BFG is a great power supply, but you could save a few dollars here with an OCZ, Corsair, or PC Power & Cooling PSU, which are often on rebate in recent months. It all depends on the timing of your system purchase. The LCD display was an easy choice with the full HD Viewsonic 16:9 widescreen for just $180. A 21.5" monitor with 1920x1080 resolution with a 3-year warranty from a major monitor maker is certainly a good value. If you prefer a larger screen, you can find a 23" widescreen starting at $190, though most 24" are $250 or more. If you need to save a few dollars a lower resolution 19" or 20" would do. If you want more video power for gaming you can add an ATI HD 4830 for just $75-$90. This will get you into gaming and it is a terrific value at this price according to our Graphics Editor. He recommends the Radeon HD 4850 as the start of true HD gaming starting at just $100 after current rebates, or a Radeon HD 4870 512MB which you can find for as little as $155. Any of these three cards would still keep your total well below $1000. Even with the addition of the powerful 4870 512MB the complete system price would be just $910.